On the occasion of the just-concluded visit of Her Imperial Highness Princess Mako of Japan to Bhutan, I repost a photo story of the State Visit of His Majesty the King of Bhutan to Japan in 2011 that took the relations between the two countries to a different height. 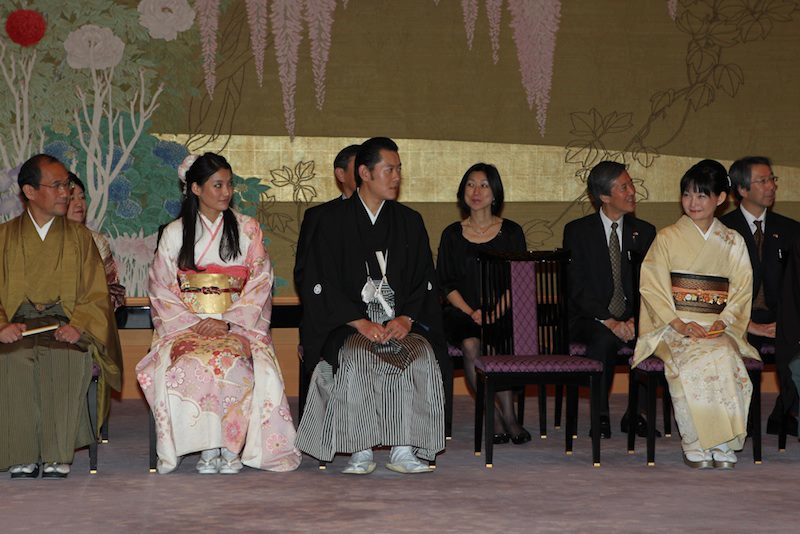 The State Visit of His Majesty the King to Japan was more than just a visit. It was a journey. A journey of life, hope and friendship. Something unexplainable which can perhaps be expressed only through images. Pictures they say tell thousand words. So while I try to put together my thoughts and reflections, here is a photo reportage. 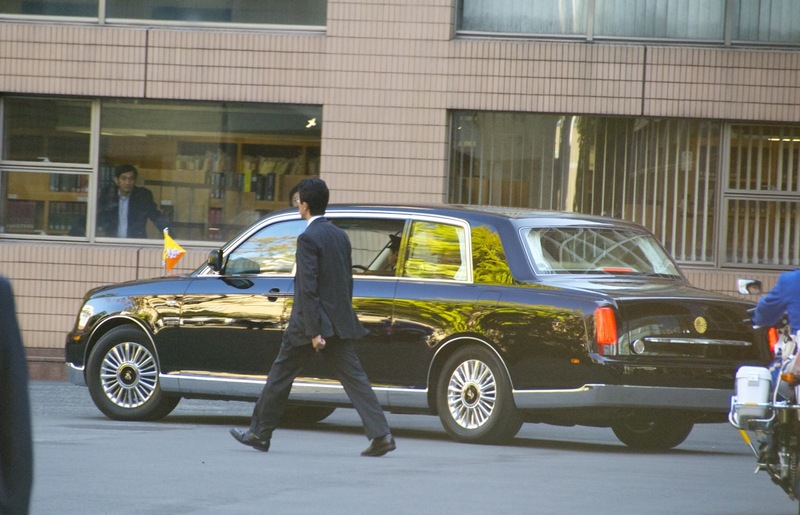 The Imperial Family sent a car from their fleet for the Royal Couple. Among all arrangements, the security detail was impressive (but what is not impressive about Japanese way of doing things). They were there to protect the VVIP at any cost. The photo that moved a nation. 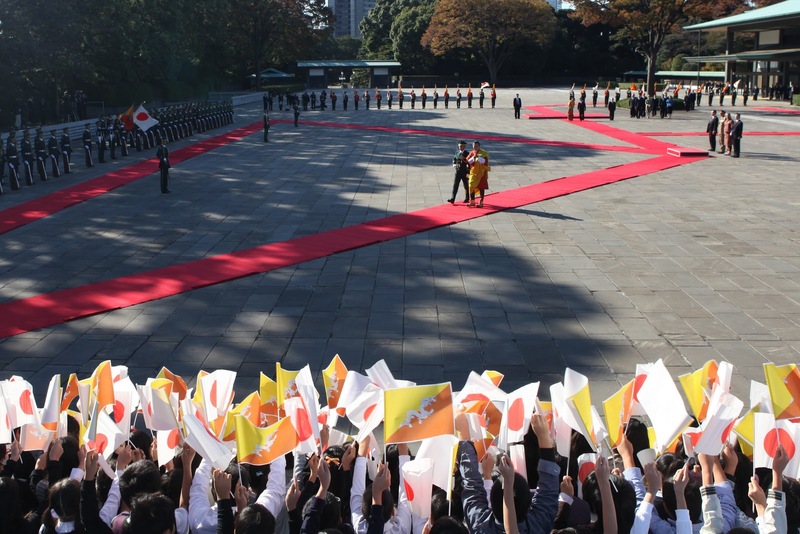 At the Guard of Honour in the Imperial Palace, His Majesty pays homage to Bhutan – Japan friendship by bowing down to the two flags. This scene made every Bhutanese proud and brought every Japanese to tears. In an unprecedented move, perhaps defying the standard protocol, the Empress called on His Majesty at the place where the King was staying. The State Banquet in honour of His Majesty the King and Her Majesty the Queen. In his banquet address His Majesty paid homage to the emperor and to the people of Japan for the special bond. I sat next to Honorary Consul to Bhutan, Hitomi Tokuda and the beautiful wife of trade minister Yukio Edano. Edano is famous for his role as the cabinet secretary in the post March 11 disaster. I also shared a wonderful joke with finance minister Jun Azumi. I also heard the most beautiful Bhutan’s national anthem played here by the Imperial household orchestra. 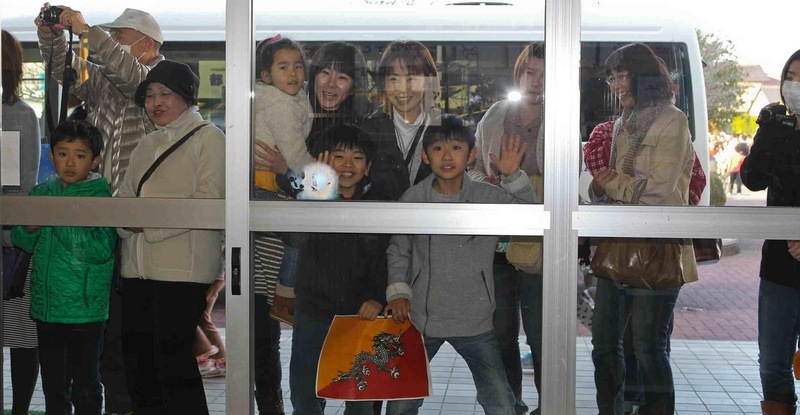 Fans and wellwishers wait for the King and Queen outside the Kieo University Hall. Everywhere we went ordinary people and photographers became a part of the scene. 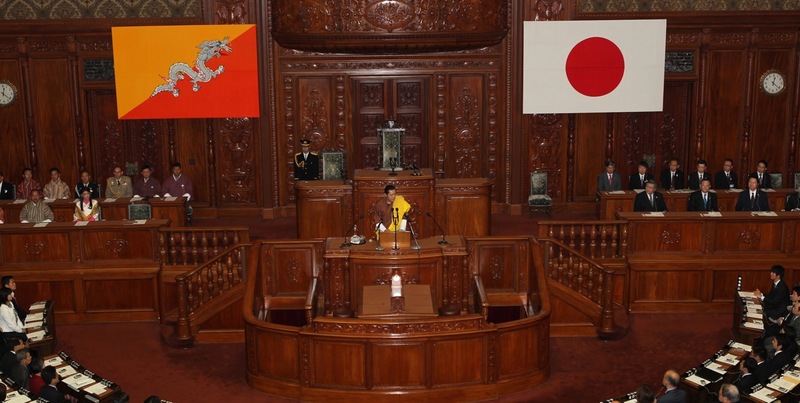 His Majesty addressing the joint session of parliament in Tokyo. His Majesty expressed his solidarity with the people affected by the earthquake and also supported Japan’s aspiration as permanent member in the UN Security Council. “Bhutan not only believes in the need to expand the United Nations Security Council, we are convinced that Japan must play a leading role in it. You have our full commitment and support.” The Speech was televised live by NHK and webstreamed by the Diet secretariat. At Meiji Shrine. 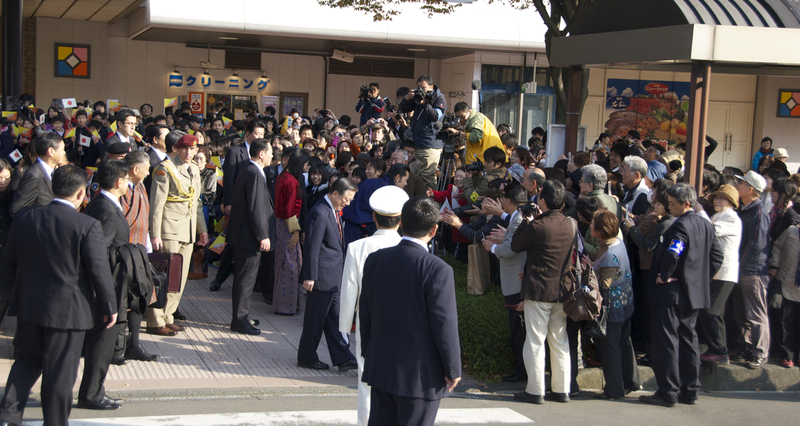 People as far as Kagoshima in South Japan were following the State Visit through newspapers, live TV reports and updates. In Sakuragako School in Fukushima those who weren’t invited wrapped the building making the Japanese security details quite nervous. Children and adults alike – all were either curious or touched by the royal presence in their locality. People came out of their houses and work places and waived Bhutan flags all along the 100 km or so ride from Fukushima station to Soma Port. “Remember there is a dragon in each one of us,” His Majesty told the children in Sakuragako School who also put up few cultural performances. Hard evidence of a tragedy. A fishing boat still stands on top of a 20 meter wall. In some places here the tsunami reached 40 meters. Soma City – Fukushima. His Majesty joins in for the prayer ceremony led by venerable Dorji Lopen – Bhutan’s second highest monk. “No nation or people should ever have to experience such suffering. And yet if there is one nation who can rise stronger and greater from such adversity – it is Japan and her People. Of this I am confident.” The King had told in his address to the Japanese parliament. Men in Black. We wore our national dress throughout the Visit except on the day we left Japan. It is almost rare that we have any pictures of ourselves from these tours. But we made exception for Japan. Some of the Japanese media covered the State Visit until the very end. We bid them farewell recognising deep in our hearts that they had done a great service to the relation between our two countries. Japan Times dedicated an editorial. 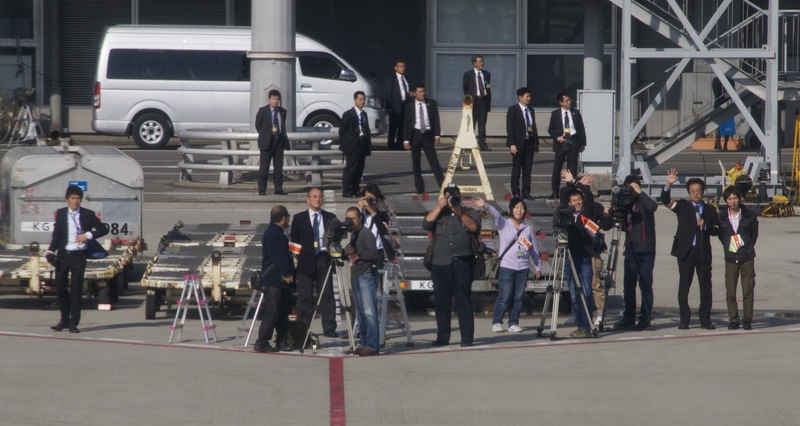 The entire Japanese foreign ministry team joined the Kyoto Governor and stayed on and waived as His Majesty and Her Majesty waived back from the aircraft. There is no goodbye word in Dzongkha, our national language. Only “see you again” and this really goes for this wonderful land and wonderful people.